The Ultimate Cutlery Collection worth $200.00 could be yours. 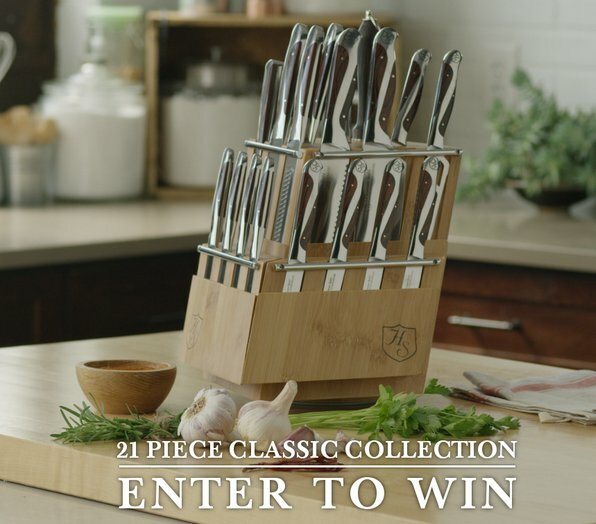 The set includes 3.5″ paring knife, 7″ Vegetable Cleaver, 4.5″ Santoku, 7.5″ Santoku, 8″ Carving Knife, 8″ Bread Knife, 10″ Slicer, 5″ Cheese Knife, Sharpening Steel, 8 Steak knives, two removable steak knife blocks & the beautiful V-Shape rotating Bamboo Display Block. 5 Winners: A $429.99 KitchenAid ArtisanSeries 5 Quart Tilt-Head Stand Mixer! You could win this KitchenAid Artisan Series Stand Mixer free.